The Anvil Framework and Editor are mission generation tools for ArmA 3 which allow vast, story driven missions with various objectives and rewards to be built with only a few clicks. Tactical Advance is the name of a multiplayer COOP campaign which showcases the framework. Altis has fallen entirely to CSAT forces. We cannot let this stand and must recapture the island. For months we have been planning the invasion and Command has a detailed plan which you must carry out. 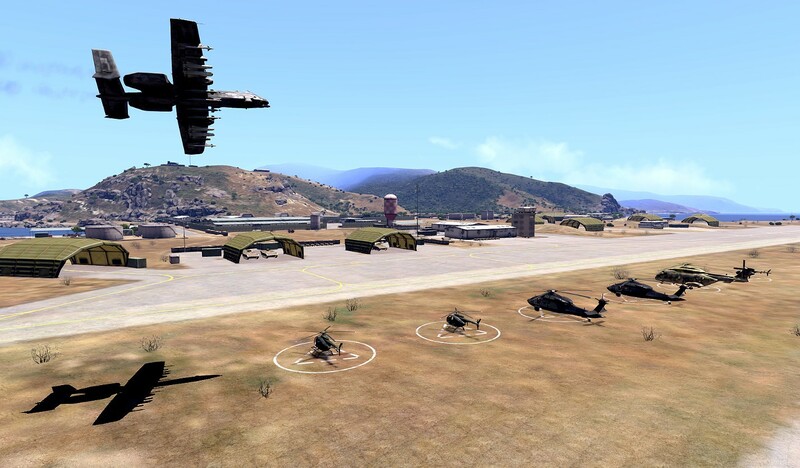 "Tactical Advance" is a showcase campaign built with a new ArmA 3 Editor known as Anvil. The campaign has three missions. First retake Stratis in an operation code named "ANGEL FIRE". A series of random special objectives will disrupt CSAT forces and force them to retreat from the island. Then under the cover of darkness a special forces team will conduct a "NIGHT ASSAULT" to prepare a landing zone. A "TACTICAL ADVANCE" will be carried out by the 22nd Infantry Division to retake Altis piece by piece. Command have identified 190 objectives across the island Altis that we need to capture. Some key objectives can as forward operating bases unlocking new weapons and equipment. Good luck. Get Tactical Advance from the link above or the entire campaign collection on the Steam Workshop. The Anvil Framework currently uses Bangabob's Enemy Occupation System for spawning infantry. It uses a slightly modified version which allows the use of "callback" functions to perform certain tasks when an objective has been completed.